Fans of 'Entourage' who aren't satisfied with mere half hour doses of Vince, E, Turtle and Drama are waking up to good news today, as executive producer Mark Wahlberg is confirming that plans for an 'Entourage' feature film are proceeding full steam ahead. Of course, anyone who watches 'Entourage' knows that in Hollywood, even the best laid plans often go awry (see: 'Medillin'). 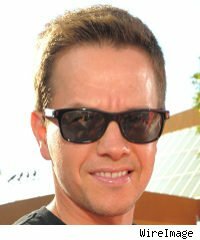 But Wahlberg, who spoke about the project at last weekend's MTV Movie Awards, is convinced that not only will the 'Entourage' film happen, it will happen in a big way. "I am more focused on making that movie than my own films," Wahlberg said in a statement that his agent must have been thrilled to hear. "I just think we can make a great movie. I think people always wanted [it] and have complained that the episodes are too short - they've always wanted more. I think we're going to do it. We just have to end strong, and this season is, by far, the best season so far." Of course, it will still be a while before any film could get going; following the upcoming seventh season, which premieres on June 27, Wahlberg says that there will be another six episodes next year where they plan to "end with a bang." How big a bang? Well, no word yet on any actual plots for the potential feature, but Wahlberg says that a trailer where "you see Jeremy Piven and Lloyd waking up in bed together in Vegas" is not out of a question. And that would be a pretty big bang.